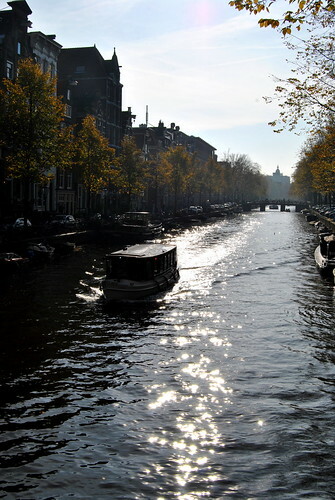 A couple of weeks ago we went on a daytrip to Amsterdam. We were with a lovely bunch of people : my sister Maggy, her husband and their three kids, my husband, my two daughters and myself. So quite a pack! We parked our car at the RAI Park & Ride which is recommendable when going by car. Parking space is scarce and very expensive in the centre of the city. So better park your car at a park and ride and take a bus or tram to the centre. We paid less then 8 EUR for the car park ànd a ticket to and from the city centre (that was for 4 people)! 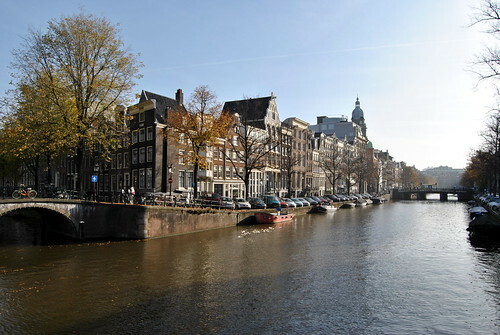 But please check the conditions and closing dates on the website before travelling to Amsterdam. We arrived in the city centre at about 10 am. We were so lucky with the weather… it was a lovely autumn day, which was perfect as we wanted to stroll around a bit in the city. 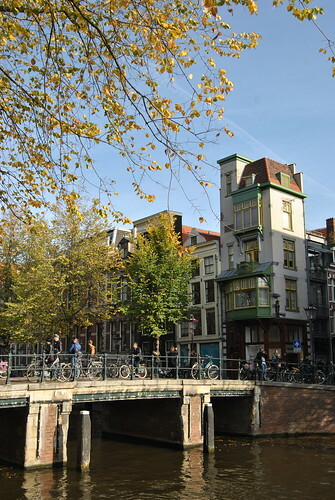 We began our walk at the crossing of the Keizersgracht and the Reguliersgracht. 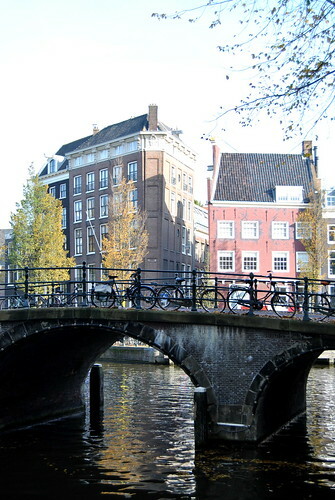 Immediately we were greeted by what Amsterdam is famous for… canals with fab canal houses, bridges, and… bicycles! 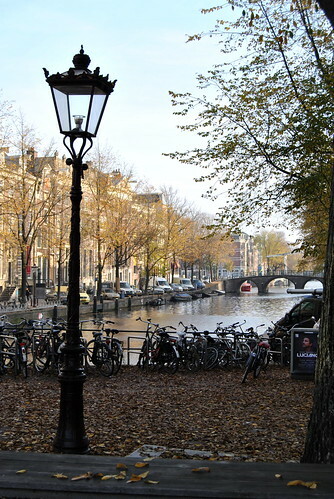 Amsterdam was still waking up as we walked towards the Rembrandtplein. This place is known for its nightlife. 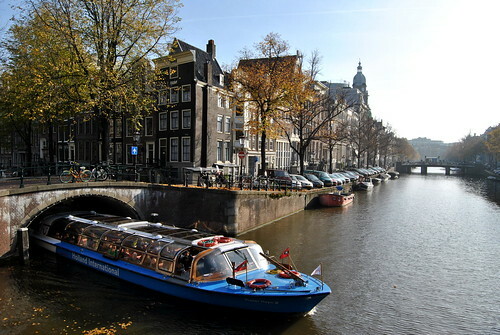 There are heaps of pubs, clubs and restaurants so when you are spending the night in Amsterdam, you know where to party! At the Rembrandtplein we had a coffee at the pub ‘The Tree Sisters‘. 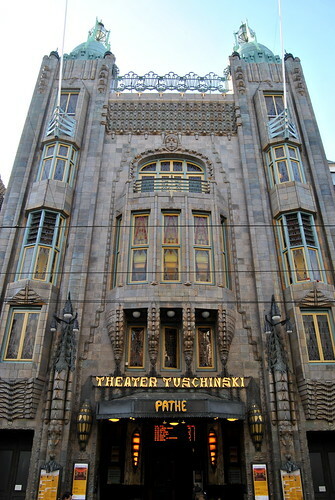 After our dose of caffeine, we continued our walk, passing the Tuschinski Theater. This is a beautiful art deco building. It’s a cinema and apparently inside the theatre is richly decorated. So if you’ve got the chance… a night at the movies is a must! The beautiful art deco façade from the Tuschinski theatre. 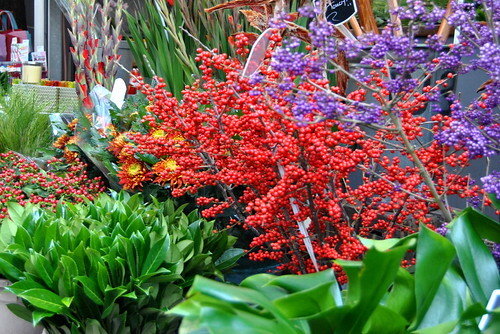 We walked towards the Bloemenmarkt, which is a floating flower market. This market is held on the water since 1862. 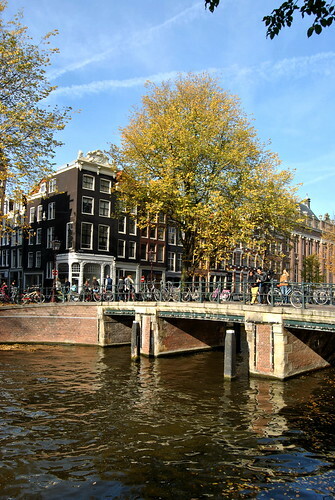 It is now a place which attracts a lot of tourists and if you want to buy some typical Amsterdam souvenirs, you’ll find them here! 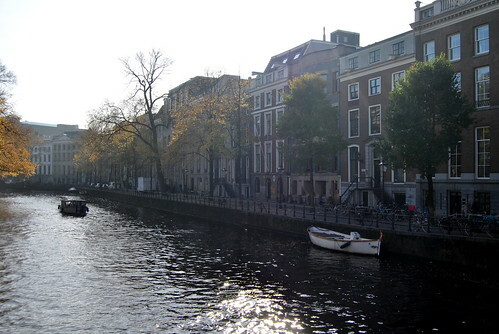 From there onwards, we walked towards the Gouden Boog (= The Golden Bent), which is part of the Herengracht. There are heaps of grand, luxurious mansions lining the canal. Most of them are in the classicistic style but are luxuriously decorated inside and out. I would definitely want to live in one of these houses… Most of them also have a beautiful, old garden apparently. 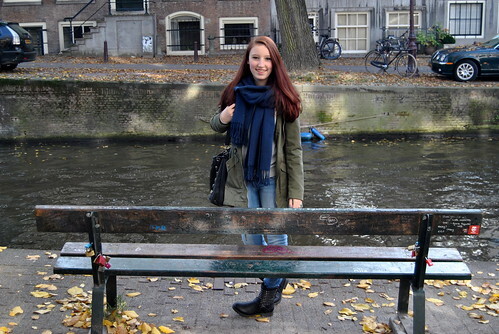 Our next stop was a bench at Leidsegracht 2. 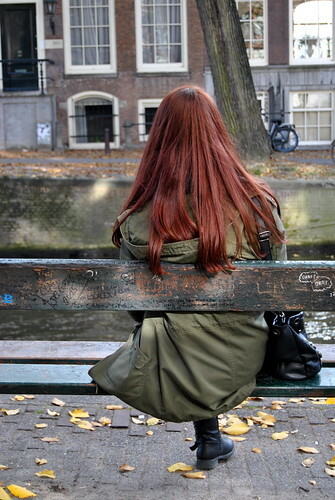 This bench is famous because of the film ‘The fault in our stars’. Especially my sister’s teenage daughter Louise was really glad to see this bench as this film is one of her favorites (and a special thanks to Louise for letting me use these pictures 🙂 You look really beautiful in them!). 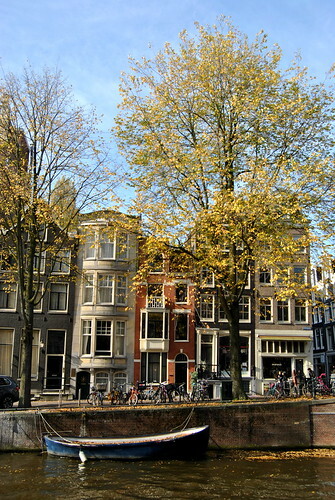 After the Leidsegracht we went to the ‘Negen Straatjes‘ (= nine streets). This neighbourhood is filled with beautiful boutiques, delicatessen shops, barber shops, second hand clothing shops, little shops selling jewellery,… In one of these places I bought my comfy grey woollen vest. 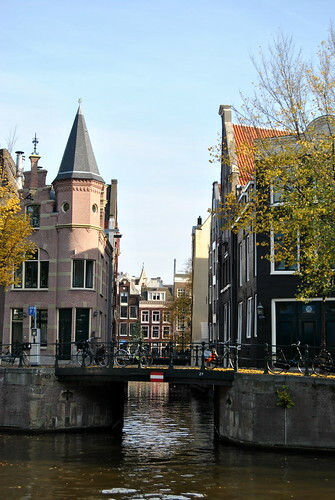 It is a lovely and lively neighbourhood to walk around and it is much more relaxed to do some shopping here instead of in the crowded Kalverstraat. 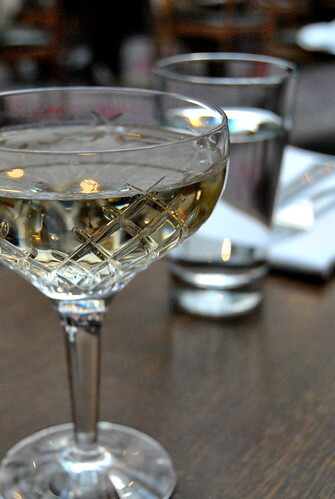 We had worked up quite an appetite and decided to have lunch at Lotti’s, the restaurant of the Hoxton Hotel at the Herengracht. We entered in the hotel lounge which is really inviting to have a cup of coffee whilst reading the paper. The restaurant is right next to the lounge. It is bright and light as it has a glass roof, which apparently can be opened on warm days so it must be lovely to have diner here on a warm summer evening. The staff at Lotti’s was really friendly. I had the char-grilled chicken with tomato-aioli sauce and my husband had the beef fillet with new potatoes and roasted broccoli. We enjoyed our lunch and were glad to rest our feet for a while! Apparently the hotel is also really nice. 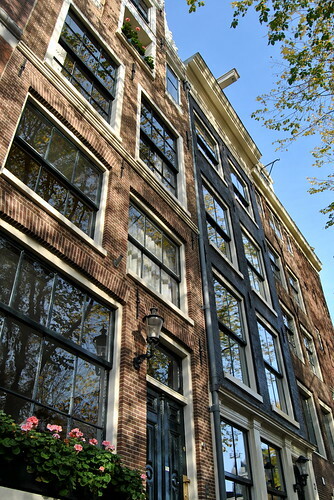 So if you want to book a hotel in a great neighbourhood… you know where to look! 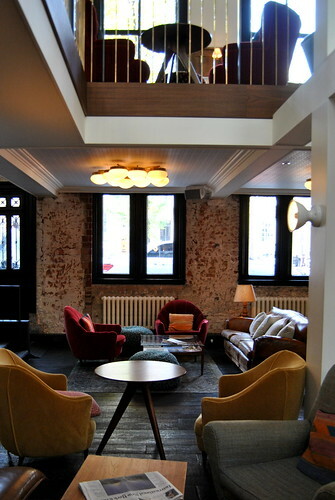 The lovely hotel lounge of Hoxton Hotel. 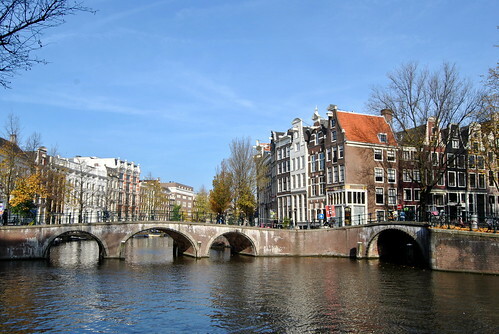 If you are interested in more tips ‘n trips about Holland, why don’t you check out this post from a couple of weeks ago? 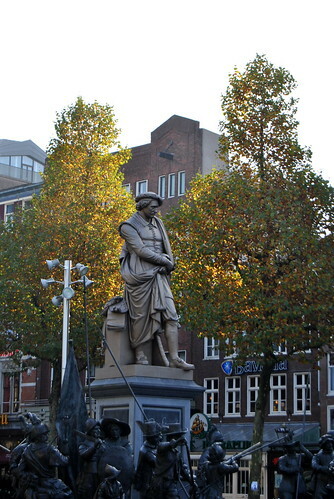 This entry was posted in Holland, Travel and tagged amsterdam, holland, Travel. Awww! So jealous! 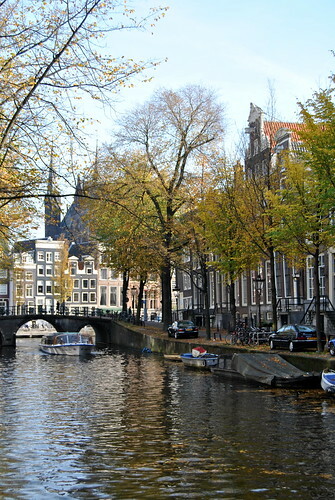 I’m dying to go to Amsterdam. My sister went a couple of years ago and loved it. She was amazed at how everyone – absolutely everyone – rides bikes. So great! Oh dank je! Ja… ‘t was me een zalig dagje 🙂 en zo’n geluk met het weer!! Prachtige herfstdag was het. Groetjes!